Poles apart, Fryderyk Chopin's F-minor Concerto Op. 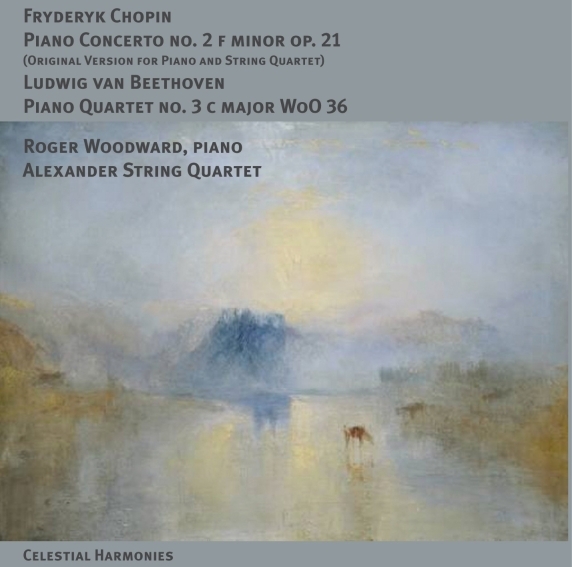 21 from 1829, its miraculous version for piano and string quartet from 1832, and Ludwig van Beethoven's already mature C-major Piano Quartet WoO 36 from 1785, leave performers intrigued to reassess Chopin's early Warsaw period (1826-1831) and Beethoven's Bonn period (1781-1792). Propelled by the revolutionary forces of their time, crucial points of departure in the lives of the fifteen year-old Beethoven and nineteen-year-old Chopin produced visionary, brillante-style works 44 years apart, much earlier in their creative lives than could ever have been expected. Both broke new ground as one rejected the ancien régime for the Enlightenment to greet the other in the early morning of Romanticism. If Chopin's memorable achievement from his early period was the posthumously published E-minor Nocturne Op.72 no.1, composed in 1827 (or as Jan Ekier proposes, more likely in 1829), another work in A-flat which closely resembled a Nocturne (at least in all but name) rivals the E-minor Nocturne's position as the alleged ne plus ultra of the period. Completed in September 1829, the same Nocturne-like work in A-flat, was enshrined by Chopin as the Larghetto for the central movement of an F-minor Concerto. Based on a mazurka, work on a Finale for the same Concerto commenced in late 1829 before a tempestuous, opening Maestoso was added in early 1830. However, during his travels throughout Europe in the first part of 1830-31, Chopin lost the orchestral parts to his F-minor Concerto. In the meantime, he composed an E-minor Concerto before he was able to complete the full score of the F-minor and the E-minor was published as his First Concerto Op. 11 in 1833. The F-minor Concerto was subsequently published in 1836, by Breitkopf & Härtel, Leipzig, entitled: Second Concerto pour le piano. Avec accompagnement de l'Orchestre ou avec Quintuor. Despite the fact that not all information has yet come to light surrounding the orchestration of the F-minor Concerto, it remained clear, two years after its first performance, that it was Chopin's intention that the work should exist in a second version for piano and string quartet with double bass. It is possible that it was in this enlarged string form that the first private performance was accompanied by a small chamber orchestra directed by Karol Kurpinski in the drawing room of the family house when Chopin first performed his F-minor Concerto to a select audience on March 3rd, 1830. The first public performance quickly followed for a large audience of 900 at the NationalTheatre, Warsaw, on March 17th, with a repeat performance five days later. Although Chopin never played the work again publicly, the F-minor Concerto remained, according to his pupil Mikuli, "particularly dear to Chopin's heart". Moreover, according to Liszt, Chopin retained "a marked predilection [for the Larghetto] which he liked to play frequently" in a two-piano version with his students. His E-minor Concerto Op.11 was also published as a piano quintet as well as a solo work. Having celebrated its 25th Anniversary in 2006, THE ALEXANDER STRING QUARTET has performed in the major music capitals of four continents, securing its standing among the world's premier ensembles. Widely admired for its interpretations of Beethoven, Mozart, and Shostakovich, the quartet has also established itself as an important advocate of new music through over 25 commissions and numerous premiere performances. In 1999 BMG Classics released the Quartet's nine-CD set of the Beethoven cycle on its Arte Nova label to tremendous critical acclaim. The FoghornClassics label released a three-CDset of Mozart quartets dedicated to Haydn in 2004; the Shostakovich cycle on six CDs in March 2007, and the complete quartets of Pulitzer Prize-winning American composer, Wayne Peterson. The Alexander String Quartet's 25th anniversary was also the 20th anniversary of its association with New York City's Baruch College as ensemble-in-residence. This landmark was celebrated through a performance by the ensemble of the Shostakovich string quartet cycle at Engelman Recital Hall in the Baruch Performing Art Center in April 2006. Of these performances, The New York Times wrote, "The intimacy of the music came through with enhanced power and poignancy in the Alexander quartet's vibrant, probing, assured and aptly volatile performances. Seldom have these anguished, playful, ironic and masterly works seemed so profoundly personal." The Alexander was also awarded Presidential Medals in honor of their longstanding commitment to the Arts and Education and in celebration of their two decades of service to Baruch College. The Quartet makes its home in San Francisco where as professors of Music at S.F. State University, the members direct the Morrison Chamber Music Center's Educational Program in the College of Creative Arts. They have been Ensemble-in-Residence with San Francisco Performances since 1989 and anchor that august institution's renowned community outreach and educational programs. First violinist Zakarias Grafilo joined the Alexander String Quartet in July, 2002. A native San Franciscan, he secured his early musical training at the San Francisco Conservatory of Music and as a member of the San Francisco Symphony Youth Orchestra, serving as its Concertmaster in 1992. Grafilo graduated from San Francisco State University where he was a founding member of the Chamberlain String Quartet, Assistant Quartet-in-Residence to the Alexander String Quartet. Prior to joining the Alexander Quartet, he served as Principal Second Violinist of the Pacific Symphony and Concertmaster of the Stockton Symphony. Second violinist Frederick Lifsitz was born in Ann Arbor, Michigan in 1961. He grew up in Newton, Massachusetts, and studied violin with David Schreiber and Marylou Churchill at the All Newton Music School before leaving for Indiana University to study with Henryk Kowalski and Paul Biss. He became Concertmaster and soloist with the Tanglewood Festival Orchestra under Seiji Ozawa and performed regularly with the Boston Symphony Orchestra before joining the ASQ in April, 1987. Lifsitz lives in San Francisco with his wife and two children. Violist Paul Yarbrough is a native of Clearwater, Florida, and studied at Davidson College in North Carolina, Pennsylvania State University, and the Hartt School of Music, where he was awarded the Artists Diploma and a citation for Special Achievement in Instrumental Music. Mr. Yarbrough is the founding Artistic Director of the Yehudi Menuhin Chamber Music Seminar. educational programs in chamber music. The Alexander String Quartet also recorded the 3rd and 4th string quartets and the string trio by Peter Michael Hamel for Celestial Harmonies in 2006. 5 Adagio con Espressione 8'09"